I love to find easy ideas to DIY for my patio. Like bird baths upcycled from things around my home. 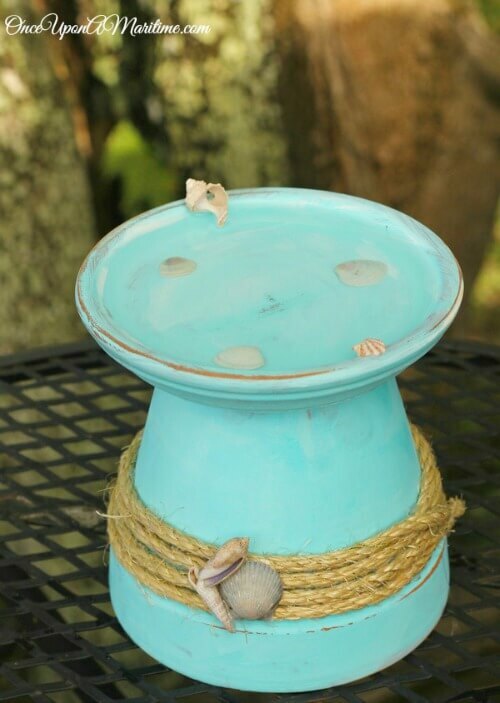 I’ve found DIY bird baths from various sources for you to consider making. I bought a solar bird bath from Wayfair a couple of years ago. But now there’s a crack inside it, so I’m using a plant saucer setting inside the bird bath. And believe me, I have birds drinking and bathing in it all day long! This is a great idea using a glass lid and chain. 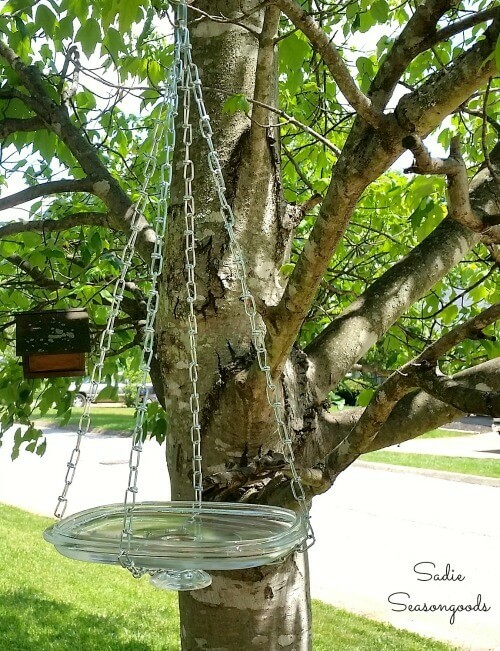 A simple and cheap way to create a hanging bird bath. It doesn’t get much easier than trash can lids turned upside down on stones. Have an old chair sitting around? 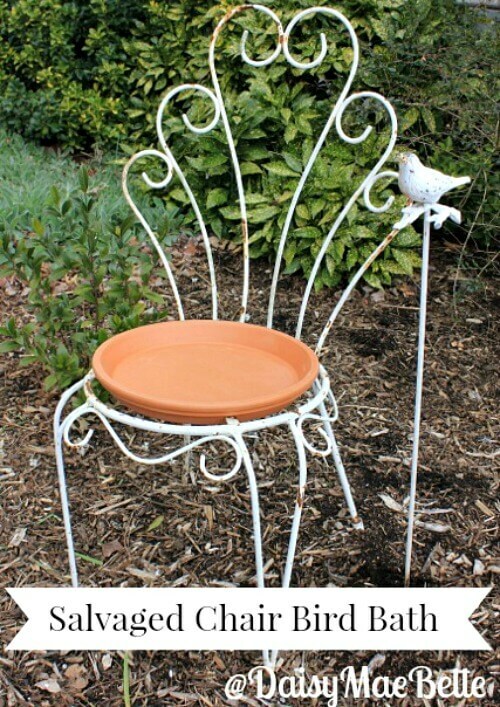 Measure the seat and see if you can find a plant pot saucer to fit on top and you’ve got an instant bird bath. This one is just a terra cotta pot saucer on a tomato cage. This one is a little more work. Check out the link below the photo. 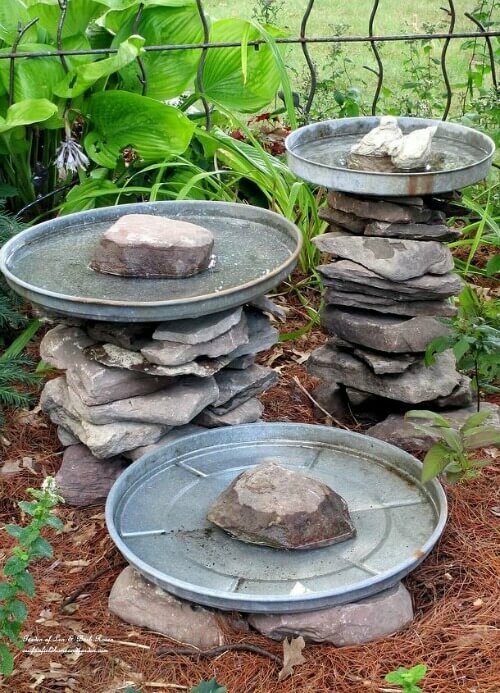 This DIY bird bath has a few steps to it. But the result looks pretty snazzy. 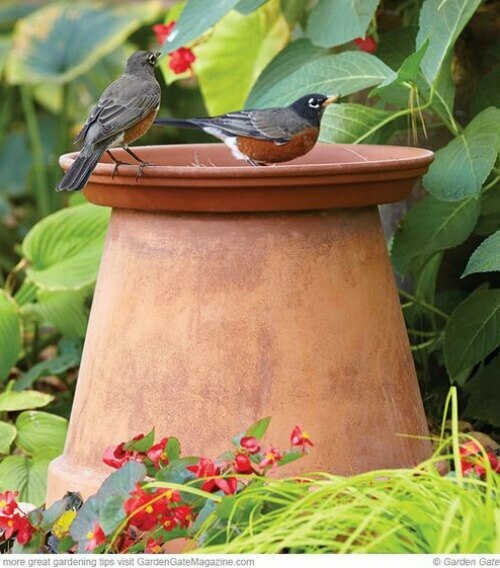 This bird bath is comprised of terra cotta painted and given a decorative nautical touch. If you decide to paint the bird bath, make sure the paint is non-toxic. 1. 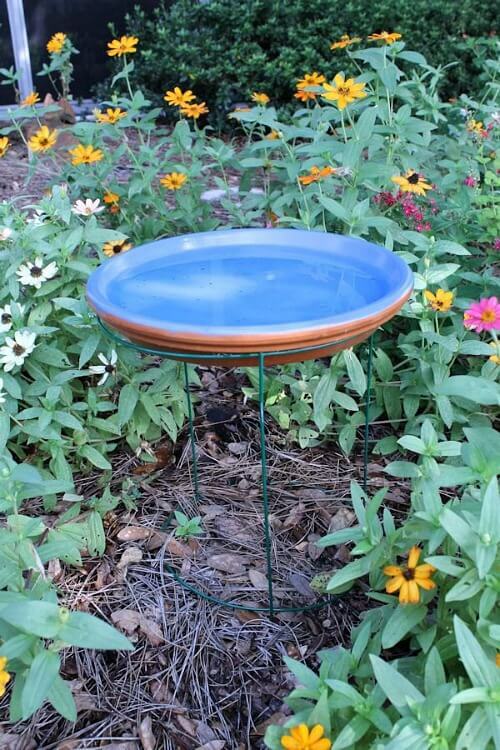 You don’t want a bird bath that is more than a few inches deep. That way they can safely bathe. 2. Be sure that whatever you decide to use is easy for you to clean, as you want to keep bacteria away from the birds. 3. Add rocks for birds to perch on so they don’t get wet unless they are bathing. 4. If possible locate your bird bath in a shady area. 5. It’s best to locate your bird bath away from shrubs where cats could be hiding. 6. Keep the bird bath clean and the water fresh. I love to watch the yard birds. I no longer have tall trees to provide shade, but the birds do not seem deterred. I have my bird bath on the patio where I can watch from my living room and easily take photos. 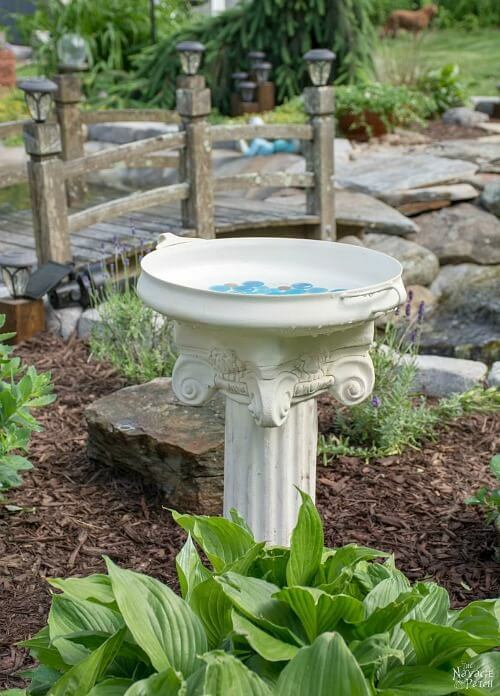 You likely have all kinds of things around your home that you could turn into a bird bath. Anything that holds water and isn’t very deep will suffice. You could also look for items to use on your next trip to your local thrift store. The yard birds will be very appreciative of your efforts and you’ll enjoy watching them. Love the idea with the glass lid and the garbage can lids. I haven’t had much luck–so far–with bird baths. I’ll be trying some of these. You’ve collected some great ideas here. These birdbaths are as esthetically pleasing to look at as they are helpful to the birds. So many great ideas! I have a bird bath but I did not know I was supposed to put a rock in it for the birds to perch on. As soon as I finish this comment I will be doing this! I als think I am going to make another birth bath closer to my window using one of these ideas so I can watch them drink and take a bath. I hope that you are enjoying a little Spring weather. Brenda what a great post! Two reasons, lol! 1) I had a turtle sandbox / used for the grands until the out grew it….then I thought to dump stuff in it to make compost. The lid is a bit caved in on the top so whenever it rains, water pools there and the birds use it as a birdbath! Wow, some clever ideas there that I would not have thought of at all! All budget friendly. 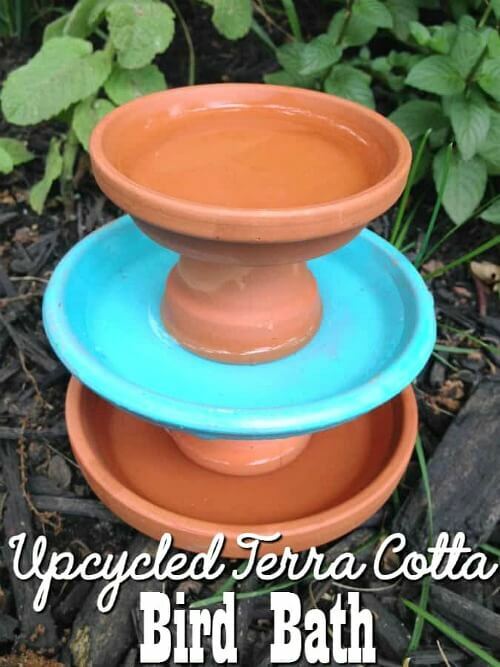 Great ideas; I am using a plain terra cotta saucer right now but I would like to make something a little more decorative (and I would like to add a birdbath to the front yard as well as in the backyard). Thanks for all of the ideas (so clever, economical, and attractive). Such cute ideas! I love the glass lid idea, how amazingly creative! !